In a conference call with analysts today, Lionsgate CEO Jon Feltheimer says they will wait “another week or two” before deciding whether they will make a sequel to ‘Ender’s Game’, which was released in theaters one week ago today. He also mentioned they are considering a TV series spinoff. 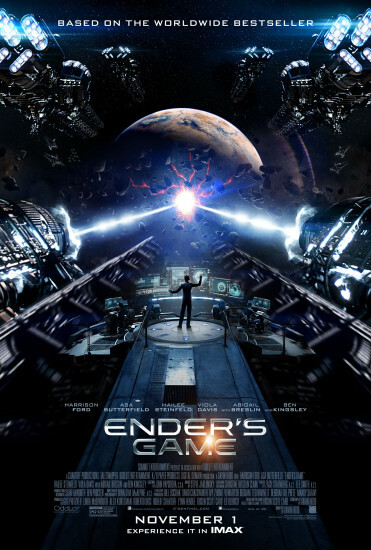 According to BoxOfficeMojo.com, Ender’s Game has earned $32.5 million as of Wednesday, November 6. If they do a TV series spinoff, do you think they’d do something completely original in the Enderverse or try to follow the Shadow series or Ender in space? Do you think Asa Butterfield would be asked back as Ender for television and on that note, would he even do television? Let us know what you think in the comments! At first I was pretty put off on the idea of a TV spin off, but now I kinda like it. Even if they don’t follow the books like they do in the movie, it would be pretty fun to have a deeper look in the Ender world. I could see them creating new kids to write the story around, but have Ender/Peter/Valentine as a background story. If they do a TV show, while I’d love to see Asa/Hailee/Abigail in it as leads, I feel like it’s kind of a stretch since they have some pretty big stuff going on. For TV, I’d want a totally new story set in the Enderverse. The books are just too complicated to follow. I’m pretty sure they’d be able to do something great too, after all, they do Mad Men. I mean that’s probably exactly where they’re going though, otherwise why use the word “spin-off”? I do not think Asa agrees to play a role on the television, he is a film actor. I would think the announcement of the new Ender’s Game book sequels will play a big part in all of this. Personally I think the TV series would be a great option for the Shadow series. I would love an HBO: following GoT’s success, it is possible to now produce a sci fi show with no advertisements and wthout the 24 40-minute episode per year where half of them are fillers. it’s just MHO. Showtime could do a good job too. Just don’t give it to the people at Syfy. Sure, they have Haven, Being Human and Warehouse 13, but I don’t see them doing that well with Ender. To me SyFy’s crowning glory will always be Battlestar Galactica. On another note: The fact that in some countries the movie will come out later (Here in Mexico we’ll have to wait until December 6 and I think some countries in central and south America have the same problem) is also having a bad impact on the film’s true earnings. Added to that is the fact that the second formic war trilogy was also announced, so Lionsgate has a lot of options to choose from, both in format and plot. I just hope that the lacking numbers don’t discourage people who live in those countries to not see it. Opening weekend it made a lackluster $2 million internationally in its opening weekend. Sadly, Thor comes out this weekend is basically guaranteed to kill box office numbers for everything else. More sad news, they distributing company over here (Diamond Films Mexico) delayed it until December 27. Lionsgate really need to watch closer the distribution deals, specially in a country with so much piracy like Mexico, added to the international torrent problem. A tv show would be cool but shows, especially good sci fi shows, have a tendency to get dropped before they’re actually completed leaving us with horrible cliffhangers like Firefly or Invasion did (ignoring the fact that Firefly gave us Serenity). But a show would be cool (Haven, Supernatural if you want to talk successes). Honestly, I think the Shadow Saga would make a better show as it has a lot more action, and the rest of the Ender Quartet makes more sense as far as a movie franchise goes since it actually follows Ender unlike Shadow where he’s more mentioned than anything (plus they eliminated the Locke and Demosthenes stuff from Ender’s Game). Honestly, I’m torn…on one hand, I can’t see any film sequels really working; but on the other, I would dearly love to spend more time in the Enderverse.